We grow just a select few Dahlias now but over the decades we’ve been able to observe hardiness by cultivar. This is consistently one of the hardiest. And its a wonderful perennial. Finely divided foliage is dark, nearly black on a compact plant to 2′ x 2′ with stunning black/velvet red single flowers. These appear consistently from June to frost. Shorter stems lead to a smaller cut flower but it is still wonderful none-the-less. The intense deep flower color is a perfect match for the foliage yielding a dark tinted plant. Provide contrasting light to golden colored foliage for extra depth. Excellent border perennial for full sun and rich, well drained soil with regular summer irrigation. This hardy perennial requires very little protection other than a layer of mulch in autumn. Even a layer of leaves will provide a modicum of cover. Emerges with truly warm weather in spring. Protect emerging plants from snails/slugs. Full grown plants seem less affected. Loved by pollinators and moderately deer resistant. Far from 100% but still one of the last they will munch. 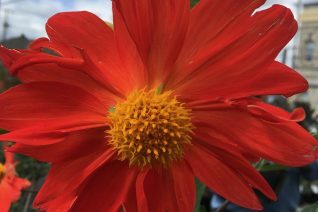 We choose the Dahlia varieties that we grow very carefully. 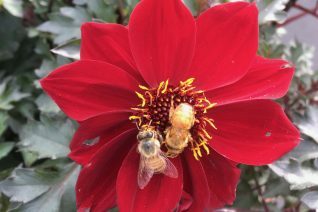 Time has taught us that all Dahlia cultivars do not share the same cold hardiness. What we’ve whittled down is a list of Dahlias that have never frozen away for us. This marvelous selection boasts large single firey orange flowers on tall waving stems. The intensity of the flower color is shocking and it make a great denouement to summer blooming well into autumn. To 5′ tall in the ground this robust perennial requires some protection as it first emerges to deter slugs/snails. Once its up and growing fast this is less of an issue. Full sun and rich, well drained soil with regular summer irrigation. Excellent and lurid cut flower. Excellent hardiness to cold- it is not necessary to dig and store the tuber so long as the soil is well drained. Mulch in autumn post first frost adds insurance. Moderately deer resistant.